Over 100 women came together in this mammoth project featuring long and short stories from women. This amazing superstar lineup of empowered authors took part in this anthology. Compiler Carla Wynn Hall lead the way by gathering together an amazing group of women who all met on the Women’s Empowerment Network, a Facebook group for women. Grab some tea or coffee and relax as you read about survivors and heros in their own lives. Valerie’s chapter is titled “Amping Up for a Second Career Using Social Media.” What is awesome about this compilation are the lives changed utilizing this relatively new mode of connection-the internet and social networking! 44 women from different states a and country’s have come together to share, encourage, and promote healing and wholeness! This book captivated me from the foreward. These woman share their heart, their struggles and their accomplishments through victory! There are so many levels that can be drawn from in this book. Whether you are a business person looking for ways to overcome obstacles or a woman looking to build self esteem or even someone who enjoys to read memoires, then this book is for you. I am happy to be part of it and excited to see what comes next. There is a quote that says, “When “i” is replaced by “we”, even illness becomes wellness. This book is the “we” in wellness. Any pain, grief, insecurity, shame, etc. you might be facing is touched upon by these 44 women. If you thought you were alone in anything that you might be enduring, you are not. These women offer support and reassurance that there is light on the other side. I am thankful to these women for sharing their stories of empowerment, which are guaranteed to heal and uplift the lives of many others. Chicken Noodle Soup for the Women’s Soul … watch out! This latest release from Sacred Heart Publishing is the new positive pick-me-up every woman deserves and needs to read. 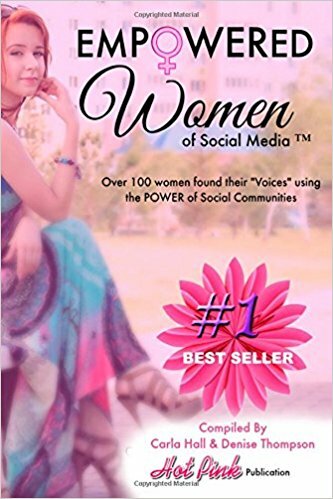 Packed with stories of tragedy to triumph; lessons and love; struggles to success; this compilation has mastered the art of sharing human experience to inspire, enlighten and celebrate a woman’s voice. I’ve already read through the first few stories and can’t wait to curl up tonight with a cup of tea and some tissues to feel the strength of these sisters and use their stories to take greater strides in my life with more confidence than ever before. How often does one discover pearls of wisdom that transforms one’s life in an instant? This compilation is so incredibly inspiring! Women from all walks of life share their stories of Empowerment and Transformation using Social Media platforms so their voices can be heard. Never have I read so many inspirational stories from so many women that have risen above major challenges that yielded immense strength and courage. It is a great reminder of the power of Social Media as the threads that weaves all of us together.